Fire rated to AS1530.4-2005 with a 90/90 rating pull-down ladders, which come complete with fire rated hatch, for use in ceiling - known as the "AM-BOSS Inferno-Boss" - fire resistant for almost two (2) hours! AM-BOSS Access Ladders Pty Ltd were first to manufacture pull-down access ladders that complied with the Building Code of Australia (BCA). With the new National Construction Code (NCC) being developed, the CSIRO ceased its Appraisal scheme officially in December 2009. The National Construction Code (NCC) was developed to incorporate all on-site construction requirements into a single code. The NCC comprises the BCA (Volumes One and Two), and the Plumbing Code of Australia as Volume Three, into its series and is the national technical document which sets the standards of building work in Australia, including non-residential buildings. The NCC is a joint initiative of all three levels of government in Australia, and was established by an inter-government agreement signed by the Commonwealth, States and Territories. The compliance of building products and systems with the BCA is provided through the CodeMark scheme. Products accredited through this scheme are automatically recognised nationally as being compliant with the Code in Australia and New Zealand. As a leader in the industry, AM-BOSS is the only company to offer a pull-down access ladder that complies to the Building Code of Australia and is CodeMark Certified. Relevant legislation requires building control authorities to accept CodeMark Certified products. Compare the AM-BOSS Access Ladder (attic ladder, pull-down ladder, loft ladder, ceiling ladder - call it what you will) with other makes. Welcome to AM-BOSS Access Ladders! The Managing Director of AM-BOSS Access Ladders Pty Ltd, Werner Hecht, has been in business since 1968. With his knowledge and expertise Werner opened the doors to AM-BOSS Access Ladders. 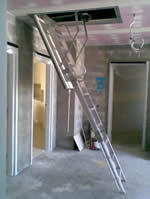 Since then we have been manufacturing and supplying you with quality roof and attic access ladders of all kinds. With these many years of experience up our sleeve, we can promise you that you will be completely satisfied and confident in our products and customer service. Utilise the above ceiling space as a convenient storage area by installing the AM-BOSS 'disappearing' aluminium ceiling attic access ladder. It is also useful for providing access to service air-conditioning plants in factories and office buildings. With its strong, simple, practical and trouble free design, the AM-BOSS 'Access-Boss'™ is extremely well suited for industrial, commercial and domestic applications. Safe and easy access ladders. Simple to install and use - easy as one, two, three. Safe and easy access to your extra space . The Scientific research bases in Antarctica have a lot of delicate equipment that needs to be stored out of the way, but they're also very cramped. Using AM-BOSS 'Access-Boss'™ access ladders frees up more space. AM-BOSS access ladders have proven to be very popular in the Middle East, where houses are traditionally built taller and on a smaller floor space than Australian Houses. They have proven to be a very practical solution for saving floor and storage space. The design of military bases is access space-conscious, with this in mind, the RAN uses AM-BOSS 'Access-Boss'™ ladders in order to access infrequently used upper levels, and storage spaces. These fold neatly out of the way, which allows for less restricted foot traffic in the corridors. AM-BOSS access ladders are at many Airports, here and overseas, to give safe access to roof tops on control towers for technicians to service the many antennas etc. AM-BOSS 'Access-Boss'™ commercial access ladders are used in large buildings, to service equipment in the ceiling space and or rooftops such as climate control, water storage, lighting etc; with no Occupational Health and Safety concerns. We all have numerous items like suitcase, books, magazines, prams and pushers. Children's clothing to be saved, camping stuff, seasonal sporting equipment, even the plastic Christmas tree. With an AM-BOSS domestic access ladder all that, and more, can be put into the space above your ceiling to free up your wardrobes for your everyday items. If you have a heating unit in your ceiling space, lighting the pilot light is not going to be a drama again. Forget about those shaky stepladders! In a matter of a few hours you will have plenty of space AND safe, easy access to your loft, attic or roof space without throwing anything out. Utilise your above ceiling space. With the installation of an AM-BOSS access ladder, and some economically priced chipboard flooring, all easily fixed, your storage problems are solved! Use your AM-BOSS access ladder time and time again, and you will because it's so easy and convenient to use. This fully assembled unit, beautifully manufactured, comes with fitted architrave, draft seal, counter balancing, adjustable aluminium ladder with the treads being welded into the stiles; and fitted fixing clips so you don't have to hold the unit up there while you are installing it. Yes, we also make special size hatches, an access ladder to suit your ceiling height on the shelf (Domestic models only), optional extras and timber ladders. A handy person can usually do all the work, but if you are too busy installation can be arranged. We also do a lot of installations in commercial buildings where access is required for the service person to check air-conditioning systems on top of the roof etc. Pick the right location you want for your access ladder system, it's not necessary to install this new unit in the same place as your existing manhole, if it is in the wrong place. Easy access top and bottom should be considered. Manufactured in die-cast aluminium and manually operated from either the top or bottom. The electric stair system is beautifully engineered and made to order in diecast aluminium, also available in powder coat finish in many colours, as an Option. The unit is fully assembled and is easily fixed to a concrete slab by dyna bolts or similar, or screwed to a timber framed opening. Electric work is minimal, plug into power point, if switches are used some wiring needs to be done. Optional Extras are available such as colour stairs, Remote Control with one sender or two senders, and smoke alarm.